A birth sampler to welcome a new family member, Bienvenue is inspired by the Ackworth School Quaker style of motifs which incorporate stylised swans, flowers and birds in half medallion shapes and cartouches. Many of the motifs carry an innate symbolism – the dog for loyalty, a bird on a branch for love of nature, the swan for purety, the butterfly for exuberance, a rose for the mother and the buds for her children, carnations for motherly love. Bienvenue is unique in that it allows for the inclusion of, not only the names and date of birth of the infant, but also for the initials of the parents and grandparents thus creating a very personal family momento. 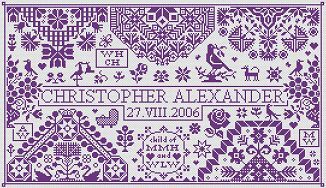 In addition to the design, Bienvenue reproduces two extra pages of grid with blanked out sections for you to add the infants name and date of birth and family initials prior to stitching. There are also some extra motifs included which can be used to fill in space if the chosen name is short and does not fill up all of the alloted space.